Black and white illusration, hand coloured. Busy street scene. 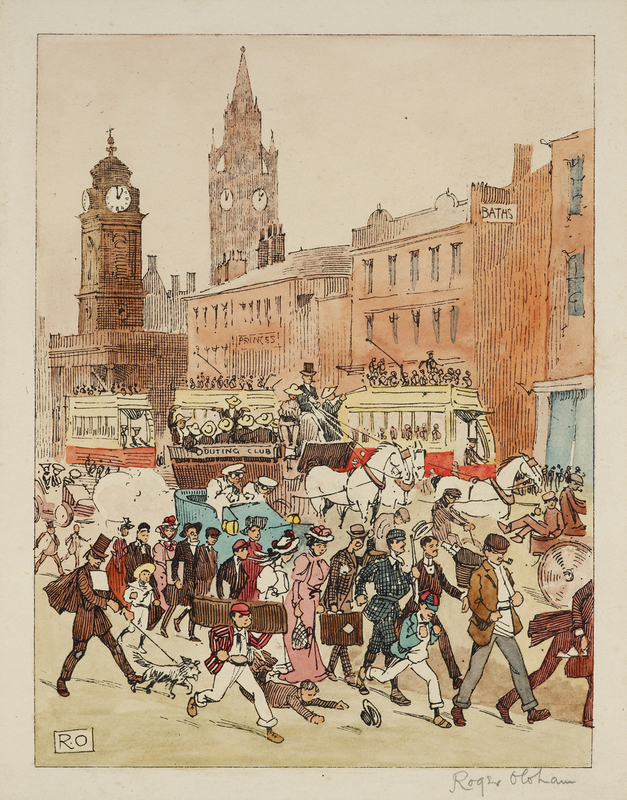 The bottom third of the image shows a crowd of all ages moving from left to right, some carrying suitcases. In the hurry, a boy has fallen and host his hat. In the middle of the image, again moving from left to right, are three trams and horse-drawn carriage, all laden with passengers. The top half of the image shows a row of buidlings, identifiably Manchester landmakrs, including what is now the clocktower of the Palace hotel. The accompanying poem reads "X for Exodus. Each Saturday at 1 o'clock/The people leave the town en bloc,/But if you wait till 10 to 2/You'll only see a very few."